Negrych Pioneer Homestead is a provincially and federally designated Heritage Site, which is believed to be the most complete and best preserved Ukrainian farmstead in Canada. Among its 10 buildings are unique or extremely rare features, including the only Canadian example of a long-shingle Carpathian. In the bunkhouse, a rare, fully-preserved working peech – the massive, log-and-clay cook stove that was once the heart of every Ukrainian home. 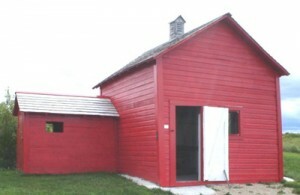 For more information on the Negrych Pioneer Homestead, contact the Gilbert Plains Historical Society, Box 662, Gilbert Plains, MB R0L 0X0 or call (204) 548-2326. This little gabled-roofed building served as a one animal a week slaughterhouse serving local farm families involved in what was known as a "Beef Ring”. The Gilbert Plains Beef Ring house survived nearly 90 years of Manitoba winters, because of the building being partially constructed from concrete. This is the last known beef ring remaining in Manitoba. Long before the days of modern electricity luxuries, farms only had ice houses or ice boxes, so beef rings were a method of regularly providing small quantities of fresh meat during warm months when spoilage was a concern. The beef ring was used in the are from 1923 to 1951, serving a membership of 16-24 families. The restoration project began in 2007, thanks to the efforts of local resident Lorne Smith who spearheaded the project to procure a municipal heritage designation to the site. The site is located south of Gilbert Plains on the Russell Trail (Rd. 142N), 1/2 mile east of hwy #274 (Rd 129W). To contact Lorne for a tour or for more information call 548-2548 or the Gilbert Plains Historical Society at 548-2326. Visitors will discover a variety of local artifacts from the early settlers of the area at the Museum. The community’s first hand-pulled fire wagon, the original horse-pulled fire wagon and the first motorized fire truck are proudly are proudly displayed on site. The Museum features a variety of local memorabilia, agricultural history and community memories. 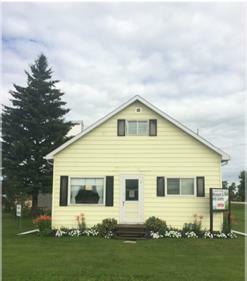 The Museum is located at the corner of Hwy #5 and Main St. near Gilbert the Golf Ball – the community’s mascot. The Museum is open July and August daily, and is accessible by appointment. For more information and tours call 548-2326. 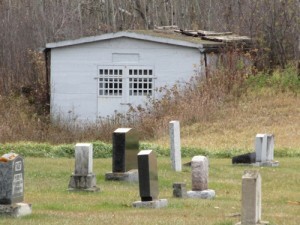 Historical enthusiasts will be fascinated with the Eldon Cemetery. A completely stone-built mausoleum is tucked at the south-east corner of the cemetery. The cemetery is located north of Gilbert Plains, turn north (Rd. 147N) and 1/2 mile west.